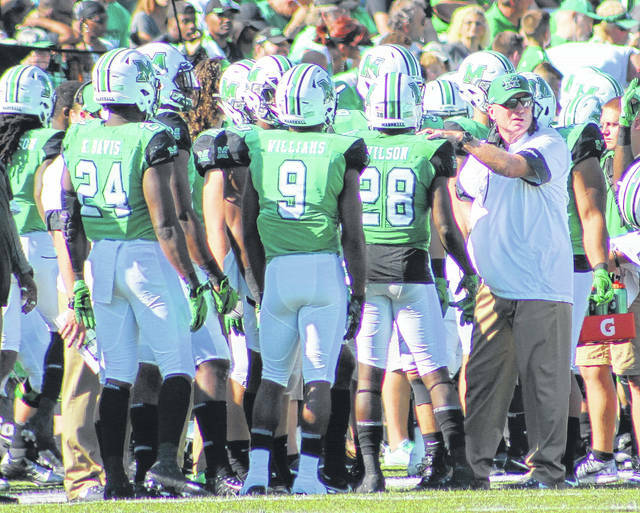 Marshall football coach Doc Holliday, right, gives instructions to his kickoff unit during an Oct. 14 contest against Old Dominion at Joan C. Edwards Stadium in Huntington, W.Va.
HUNTINGTON, W.Va. — It’s known as the Land of Enchantment. For Marshall, it’s a return to prominence. The Thundering Herd will be making the program’s 14th bowl appearance in school history when the Green and White battle Colorado State in the 2017 Gildan New Mexico Bowl on Saturday, Dec. 16, at Dreamstyle Stadium in Albuquerque. Marshall, after missing out on a bowl game last fall following an uncommon 3-9 campaign, will be aiming for the program’s sixth straight bowl victory while taking on a Rams’ squad that is in search of the program’s first bowl win since 2013 — which coincidentally occurred at the New Mexico Bowl under then head coach Jim McElwain. In fact, the Rams will be making a bowl appearance for the fifth consecutive season and are also aiming for their first bowl win under third-year coach Mike Bobo. Marshall (7-5) — which finished third at 4-4 in the East Division of Conference USA — is currently 4-0 in bowl games under eighth-year coach Doc Holliday and will also be making its debut at the New Mexico Bowl. The Herd defeated UConn 16-10 in their last bowl appearance in St. Petersburg back in 2015. MU is also 10-3 all-time in bowl contests. Colorado State, on the other hand, owns an all-time mark of 6-10 in bowl games and is looking to snap a three-game skid in postseason appearances — including a 61-50 setback to Idaho last winter in the Famous Idaho Potato Bowl. The Rams (7-5) — who tied for second in the Mountain West Conference Mountain Division with a 5-3 mark — is 2-0 all-time in the New Mexico Bowl. Besides the 2013 triumph, CSU was also victorious in Albuquerque back in 2008. Both teams enter the 2017 Gildan New Mexico Bowl matchup with one-game winning streaks. Kickoff is scheduled for 4:30 p.m.